Plagued by power outages due to storms, PECO on May 18 filed a plan with Pennsylvania regulators to build two integrated community microgrids for a high density neighborhood with an 8.6 MW load. “Severe weather is a leading cause of power outages in PECO’s service territory. For example, as a consequence of Hurricane Sandy in 2012, approximately 850,000 PECO customers experienced interruptions of service, some for as many as eight days,” said the Exelon subsidiary in a filing before the Pennsylvania Public Utility Commission. Dubbed the “PECO Microgrid Integrated Technology Pilot Project,” the advanced community microgrid consists of two integrated microgrids that would provide power to about 388 acres in a high-density area of Concord Township. The area includes several critical services or ‘public purpose’ facilities, such as healthcare, emergency services, a retirement community, hotels and gas stations. “PECO is taking significant steps…to reinforce and upgrade its electric distribution infrastructure to better withstand extreme weather events. Under the Plan, PECO will evaluate the potential of microgrids to further enhance the capability of PECO’s distribution system to withstand and recover from major storms, help ensure that critical government facilities and public accommodations will maintain power during outages, improve overall system reliability, and heighten customer satisfaction,” said the filing. The microgrid would be capable of islanding from the utility. In grid-connected mode, the microgrid’s distributed energy resources would participate in PJM wholesale markets, and the proceeds would go to PECO distribution customers. PECO said that the base design will cost about $35 million. This includes one-time development costs, one-time engineering, procurement and construction costs, and annual operation and maintenance expenses. PECO is seeking a declaratory order from the PUC for cost recovery. “PECO proposes to recover these costs from all customers because the project will provide insight into the future deployment of microgrids and integration of DERs [distributed energy resources] across PECO’s service territory, and thereby benefit all PECO customers,” said the filing. Design of an upgraded microgrid would cost an additional $13 million, and that cost may be reduced through the participation of customer or third-party DERs sited on customer property, the filing said. Some of the costs of the microgrid would be recovered through a distribution investment charge and some would be covered by base rates, said Ben Armstrong, a company spokesman. Saying the project would be the first community microgrid under a portion of the PUC’s code and sets a precedent, PECO requested PUC approval of the plan and a declaratory order saying that utility-owned DERs, installed as part of a microgrid, constitute public utility distribution plant assets and are necessary for the project to proceed. “PECO is seeking a declaratory order to remove any uncertainty regarding its ability to seek recovery of a return on and of its investment in the DER components of the Microgrid Pilot as used and useful distribution plant assets through distribution base rates established in a subsequent…base rate case proceeding,” said the filing. 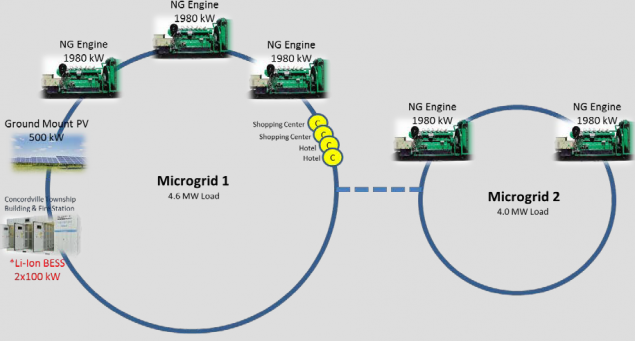 Under the plan, PECO proposes to install a microgrid controller to operate the Concord Township microgrids both while they’re connected to the grid and in island modes, plus between those modes. 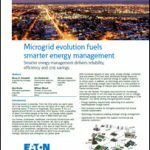 “The microgrid controller receives real-time data from distribution equipment, metering equipment and DERs to identify voltage, capacity and load on the microgrid and PECO’s distribution system. A key functionality of the microgrid controller is the ability to automatically operate DERs and configure switchgear to maintain or restore energy to the Concord Township Project in the event of power loss or interruption on PECO’s system,” said the filing. The Concord Township Project will include a number of DER technologies, said the filing. They include natural gas reciprocating engines, 500 kW of ground-mounted PV installations, two batteries totaling 200 kW and four dual-port EV charging stations. “When operating in island mode, the project will be able to provide uninterrupted service to the Concordville fire station and Township building within the project’s boundaries and is expected to restore power within fifteen minutes to other services and customers within the microgrid. As a result, services accessible and relied upon by more than 86,000 Commonwealth residents who live within a five-mile radius of the major traffic routes within the microgrid footprint will be able to continue to operate during severe storms and other widespread power interruptions,” said the filing with the PUC. PECO is considering additional DER sited on customer property to meet future load growth. This may include rooftop and carport PV facilities, wind turbines, community battery energy storage systems and EV charging stations with faster charging capabilities. “As part of this investigation, PECO will explore opportunities for customer and third-party ownership of microgrid DER assets sited on customer property,” said the filing. PECO is partnering with the Philadelphia Industrial Development Corporation on its independent campus electric system at The Navy Yard in Philadelphia, focusing on capacity expansion, distribution design and smart grid applications. Under a DOE-sponsored project, microgrid network controller technology will be tested in a subgrid at The Navy Yard. As part of its microgrid pilot, PECO will work with PIDC to identify future microgrid investment opportunities and integrate lessons from that project into PECO’s Microgrid Pilot, said the filing. If the commission approves PECO’s plan, construction would begin in 2017, said Armstrong.